People often assume that what works for one lawn will automatically work for another. This is definitely not so. Lawn watering tips and gardening maintenance recommendations can fluctuate depending on a number of variants. The location of the lawn or garden in question is a very important factor when determining the proper steps to follow in order to obtain successful results. Not only must one consider the immediate location, including such things as whether the area in question is located up-hill, in a low lying area, next to other plants or trees, etc. ; but also the region and climate involved. Temperature, amount of direct sunlight, and wind barriers might also affect watering habits. Another important consideration is the type of ground and other landscaping attributes. Lawn watering tips can be especially sensitive to the various types of soils, sands, or clays, rocks, and surrounding landscaping due to the fluctuation of drainage, absorption, and susceptibility to disease/ fungus. The type of plants, grass, trees or flowers also plays a large part in determining the type of care and frequency of maintenance, as well as the age of any growth. Newly established lawns and flower beds, for instance, will require different watering techniques than those that have been around a while. Water at the appropriate time of day. It is recommended for most areas that watering be completed in the early morning hours of the day, while it is cooler out. If early morning watering is not a possibility for you, early evening watering is normally acceptable as well. It is not recommended, however, that you water in the late evening or overnight due to the susceptibility of fungus and/or disease. Be aware of the amount of water pressure and amount of water used in conjunction with the drainage rate. A higher rate of water pressure from your hose or even sprinkler system can damage fragile or young plants. Larger amounts of water that do not allow for proper drainage can cause flooding, often drowning plants and washing away the seeds of newly planted lawns or gardens. Applying a steady amount of water pressure at a rate that allows for saturation without overflow is most beneficial. If your lawn is newly established or you are irrigating a flower bed containing young plants, continuous moisture is normally key. Assuring that the ground stays moist enough for your new lawn or plants to take root and thrive can be essential. This can often be achieved with the use of proper landscaping techniques and materials that provide for better water retention. Avoid going overboard, however, as enabling the water to pool can cause additional concerns. Lawns and gardens that are already established normally require less watering except during unusual conditions such as drought. This is due to their ability to adapt to the climate’s characteristics over time. Proper landscaping materials and methods can be an especially important issue to consider when concerns about water usage are an issue. Gardens that are placed in optimal areas and surrounded by foliage can actually reduce excess watering. 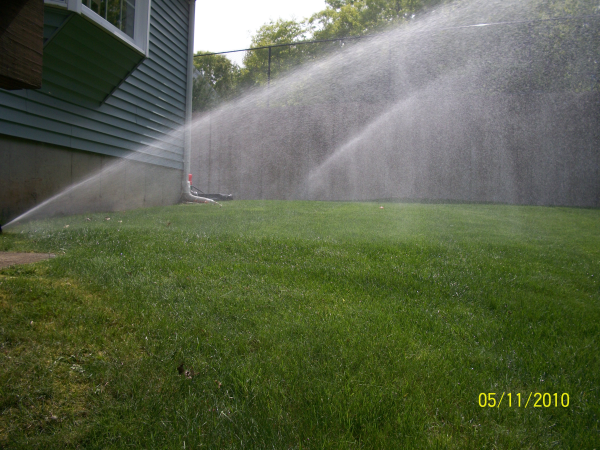 The use of reclaimed water can also alleviate extreme watering as well. Many people install water features that enable irrigation of surrounding areas while maintaining sufficient drainage, allowing for the recapture of unused water for additional use. Others capture rainwater for use in irrigating lawns and gardens. Consider the type of plants or grass involved. Some plants require more moisture in order for them to thrive, while others need minimal amounts. The use of plants and grasses that are native to the area can improve your chances for success as well, since they will have already adapted to the average conditions for your particular area. Regardless of your situation, it is always a good idea to research your specific climate, ground types, and irrigation requirements in the beginning. Applying specified techniques or methods can assure that you too can obtain a lush lawn, bountiful garden, and brightly blooming flowers season after season.